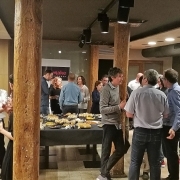 Last week there was a global impact event and it was not in Russia but in Pamplona as we celebrated the official launch of WeMake surrounded by family and good friends. The informal event took place in the Nainere hall, located in the old part of Pamplona. During the evening the guests were able to enjoy an snack with good drinks and there was even time for a brief presentation of the new project. I would like to take this opportunity to thank all those who came here for sharing their enthusiasm for the new project and I am sure that this is only the first of many future celebrations. During the event some guests gave me ideas for future events. In fact, one of them was thinking of organizing something similar for potential clients. After more than 10 years of working closely with those responsible for organizing events worldwide at Gamesa, I will try to demonstrate that I have learned something and I will give you some useful suggestions when designing company events. Set the objective of the event: the event will be different if it is only a celebration, if it is to generate relevance or if it is commercial. Celebration event: relaxed atmosphere where you can interact. Very light and informal corporate content. Relevance: It is key to prepare a powerful content that interests the guests and generates relevance for the organizer. It can be own content (seminar, talks, etc.) or that of others (e.g. invited expert). Commercial: the ideal thing is to mix playful content with commercial talk. For example a wine tasting with commercial talk at the end. Create the guest list in a way that is consistent with the purpose and type of event. Logistics: to calculate the number of participants it is always advisable to ask for prior confirmation, but even so, always calculate a percentage of between 10-20% of those confirmed who will not go. This percentage is higher the less personal relationship there is with the guests, so in relevant-generating events, if the content is not super attractive, the no-show rate may be important. Enjoy: whatever the event, the first thing the guests perceive is if there is illusion and enthusiasm in the host. There is nothing worse than organising an event and giving the impression that the hosts are obliged to do so. With these basic points clear, it is already a question of scale, budget and dedicating hours to the organization so that later during the event, everything goes smoothly and the objectives set at the beginning are fulfilled.